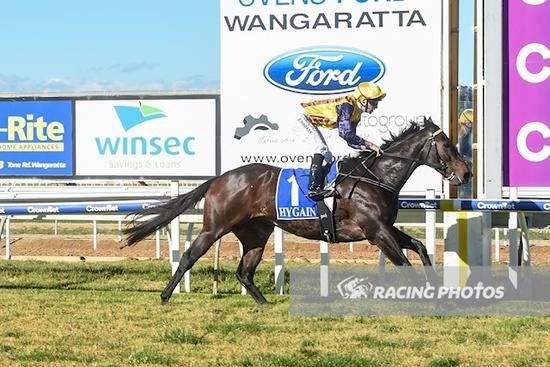 It may have taken him 10 starts to break his maiden but Chas Marlow did so emphatically at Wangaratta this afternoon for Mornington-based trainer Tony Noonan, picking up the lion’s share of a $20,000 VOBIS Gold bonus along the way. But the prize money bonus paled into significance for Noonan who more was thrilled to train a winner for long-term client Graeme Ward who was on-course to see his homebred break through. “It’s nearly a dream come true,” said Ward after the win. Making the win even sweeter for Ward was being able to have Noonan’s son Jake onboard having watching him grow up throughout his 25-year association with the Noonan stable. Jumping well from barrier 6 in the full field of 14, Jake was able to to take full advantage of Chas Marlow’s good tactical speed to take up the running to hold the fence whilst steadying the tempo. Cruising in the Soft 6 going, Chas Marlow ($2.80) turned for home in front before kicking clear to win comfortably by 3.25L at career start number 10. “Graeme and Sue have been good close family friends and clients of Dad’s over the years, been very supportive of me and patient with this horse,” said Jake upon his return to scale. “He’s taken a while to break through but he ticked all the boxes today. “I’ve gotta give my partner [Mariah] a plug. She rides a lot of his work and she’ll take the majority of credit for today’s win and so she should. Today’s maiden win took Chas Marlow’s earnings to $42,225, being a son of Widden Valley who stood at a service fee of of just $2,200 when Ward sent his mare Classy Miss to the stallion.